Playa El Tunco is a small little town made up of as many restaurants, hotels and souvenir shops as could be fit between the beach and the main road. This town has one purpose in life, and that’s surfing. 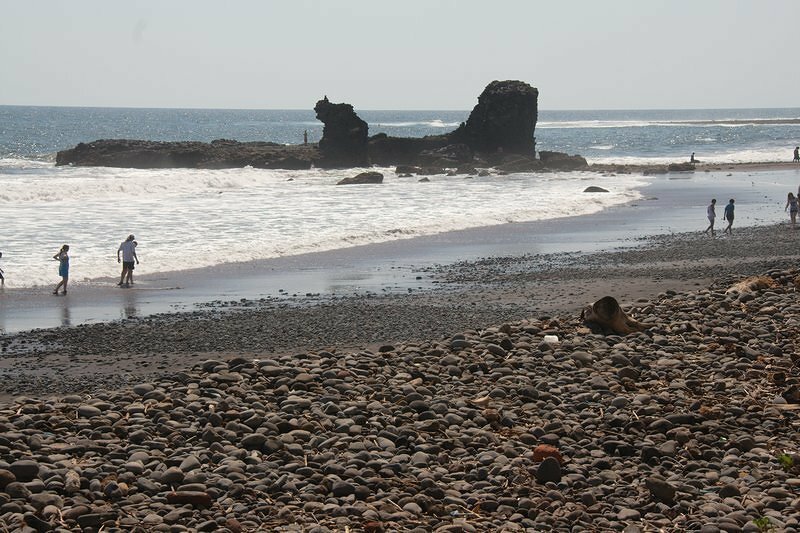 The waves come rolling into the stone-littered black sand beaches day and night, and the surfers are there to ride them. 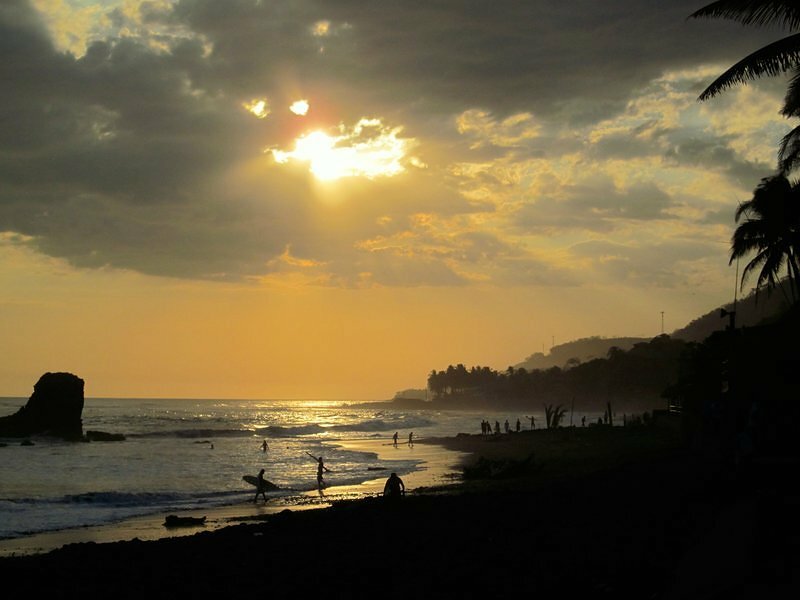 Originally we had intended to spend 4 nights in El Tunco, taking lessons on the first day, and honing our surfing skills for the rest of our time there. Things didn’t start out quite as planned however. I started the week off with a rough sinus cold and a harsh cough that seemed to sap all the energy from me. Instead of surfing, I spent the first three days in El Tunco eating pupusas and composing terrible poetry (more on this in our next post!). Fortunately, near the end of our time on the beach – the last day we had available to us – I started to feel better. It was time to surf. After careful consideration, we decided to part with some cash and take surfing lessons. We paid $15 each for a 1 hour 1-on-1 lesson with board rental included (had we just wanted to surf, boards could be rented for $5 to $10 per day). We started our lesson on the beach in the same manner you do for many sports, with stretches. Very important when you get to be our age. After we were all limbered up, we laid the board down on the sand and practised pushing ourselves up from the laying position to the surfing position. It’s accomplished with one quick action pushing hard with your arms, and popping yourself up onto your feet. If all works out well, you should be standing with your legs spread wide, balanced and ready to take the wave. Then we got in the water. We walked out until we were about waist deep and got right to it. The first bit of instruction was identifying the proper wave. The wave needs to be uniform and perpendicular to the shore. There were plenty of them, so we didn’t have to spend much time waiting. Less than a minute after getting my toes wet, I was laying on the board, with a wave coming up behind me, pushing me towards shore. I jumped up, fell, got up again, and walked back out to the waist deep water where my instructor was waiting for me. 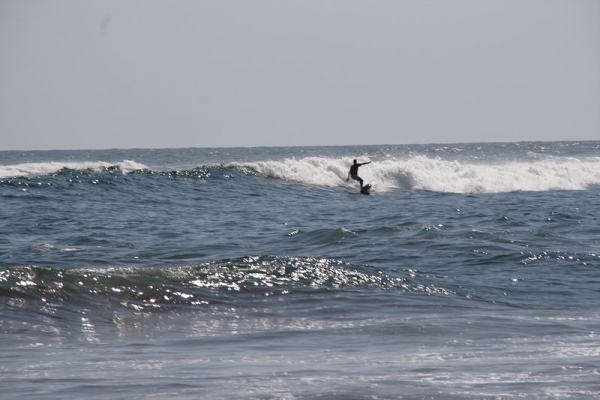 To me, it seemed that the price of the lessons and the experience of the instructors (they had been surfing for about 12 years) was really good value at Playa El Tunco. Talking with some experienced surfers, I’m not sure that the beach itself is the best for a learner, as it does drop off quite quickly. Apparently, the best thing for a learner is a shallow sloping beach that allows you to ride a small wave a long long ways so you can really practice your balance. But I didn’t feel that learning at El Tunco was overly challenging either. All tallied, I can see how surfing could be a lot of fun. But it’s going to take a lot more than a single one hour lesson before we start calling ourselves surfers. Will we try it again? Yes, I think so.